A glacier on Peru's Huaytapallana Moutain shed half its surface ice in just 23 years, officials said Wednesday, reinforcing concerns of climate change's growing threat to fresh water resources. "Recent scientific studies indicate that between June 1983 and August 2006, the glacier has lost 50 percent of its surface ice," Erasmo Meza, manager of natural resources and the environment in the central Andean region of Junin, told the official Andina news agency. 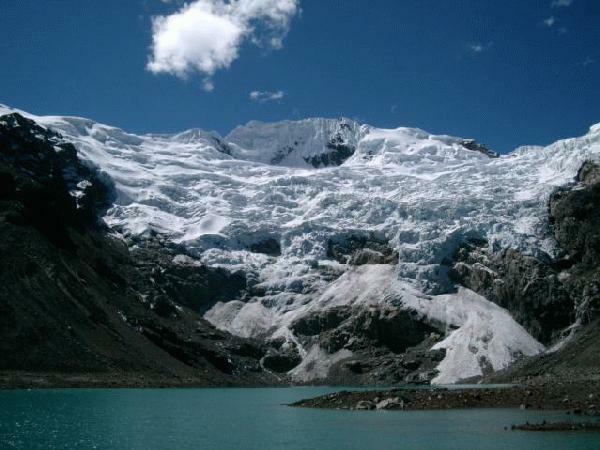 He said the five square kilometers (1.9 square miles) of ice shrinkage on Huaytapallana, whose steep, jagged glacier and breathtaking lakes are popular tourist draws, was caused by global warming and presents growing problems in agriculture, health, fresh water resources and disaster mitigation. To prevent further deterioration on the 5,557-meter (18,230-foot) mountain, the regional government of Junin is developing a project to declare Huaytapallana a natural conservation area -- a move Meza said could help prevent damage from a mining company doing a feasibility study in the area. Glacier studies are often carried out in the Andes, the so-called "Roof of the Americas" region comprising more than 100 peaks above 5,000 meters (16,500 feet). But the Huaytapallana studies show a sharper rate of glacial melt than other major findings. A 2009 World Bank-published report said that in the last 35 years, Peru's glaciers have shrunk by 22 percent, leading to a 12 percent loss in the amount of fresh water reaching the coast -- home to most of the country's citizens. In Feb 2011 Mr Meza could not have said anything but the global warming hysteria. He would have been fired. I wonder if he is still a warmest or now admits that warming has been going on since the last Ice Age?